Bored of listening to over-long speeches? Putting up with lengthy monologues at presentations, meetings or weddings can be a little frustrating when the speaker is neither Barack Obama nor Steve Jobs or perhaps your beloved brother. 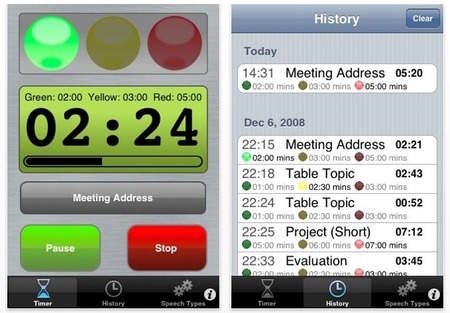 Well you can’t stop a tedious talker with your iPhone, but you can now, thanks to a peculiar app, time them and initiate a flashing buzzing alarm that may encourage them to quieten down. Speech Timer 1.6 is geared uniquely at timing speeches. Yes, you could time people on your phone’s built-in Timer on the Clock app, but this dedicated app claims it’s got something that a simple timer doesn’t. It’s not actually associated with the group called ToastMasters, but it does suggest that if you did belong to the speech hosting group, it would be a useful tool. Apart from members of that grown-up debating club, I’m not really sure who this app is aimed at: it does present itself as a serious piece of kit. I suppose people who listen to a lot of speeches, or who host at lot of presentations, meetings or panel discussions. Instead of having to watch the clock, it buzzes you when the allocated time is over. Rather bizarrely, it also stores the length of different sorts of speeches so you can allocate a time for whoever you are about to listen to. At the end of the day you can email yourself a log of who spoke and for how long. Not worth shelling out for the premium version £2.99 unless you really really listen to lots of speechs, it might be mildly useful if you come across a lot of talks in work.